Below are the official Hockomock League Boys Basketball All Stars, selected by the coaches in the league. CANTON, Mass. – Junior guard Ricardo Ripley started Monday night’s Div. 2 South preliminary round game fast with 10 points in the opening quarter to help Sharon build a solid lead and he finished it strong with eight points in the fourth quarter, as the Eagles held off a late Milton charge. Ripley finished the game with 20 points and seven rebounds and helped lead Sharon to a 56-45 victory over the Wildcats in a “home” game that was forced to be played in Canton because Sharon High’s gym had been taken over for Tuesday’s presidential primary. The gym seemed to suit Ripley and the Eagles fine in the opening quarter. Andrew Filipkowski knocked down a pair of threes to give Sharon the 7-4 lead and then Ripley started to get going. He hit a pair from beyond the arc and added a tough finish in traffic, as Sharon led 20-13 after one. The second quarter was all about the defense. Buoyed by the Sharon cheering section at their back, the Eagles held Milton to just three point and no made field goals in the second quarter. 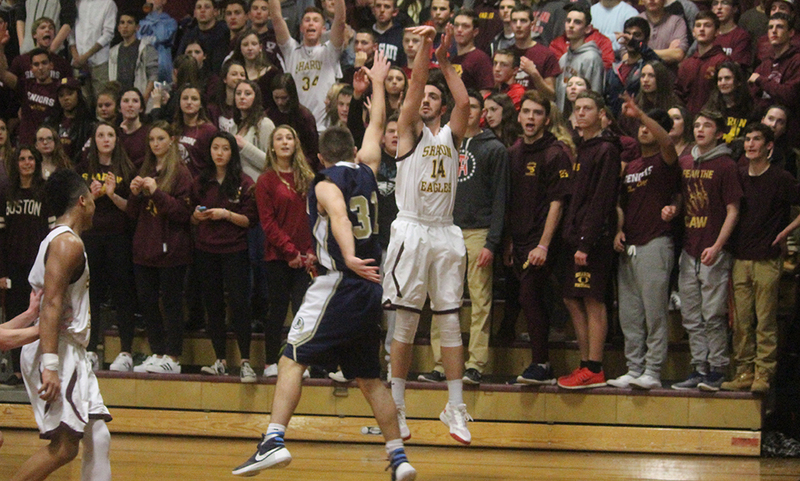 Peter Banks (six points, 10 rebounds, two blocks) asserted himself in the middle along with Mitchell Sirota, who each scored four in the second. Leading by 15 at the half, Sharon knew that it could not let its guard down against a Wildcats team that had the potential to put points up in a hurry. Jamaurie Coakley scored four of his team-high 12 in the third and Sam Ferrara scored five of his seven, but the Wildcats could not get any closer than 10 and went into the fourth down 41-27 after a big corner three by Lowerre. The fourth quarter is when Milton made its move. Eddie Hassell knocked the first of his two threes in the quarter to cut the lead to single digits but Ripley answered back with a drive to the hoop to make it 45-34. Christian Reddick buried a three for Milton but once again Ripley responded for the Eagles. A Ferrara basket cut the lead to nine and Aiden Johnson followed with a three that got Milton to within six, the closest it had been since the first quarter. Lowerre (16 points, 10 rebounds) followed it with a pair from the line and layup on the break after a long outlet by Ripley. Hassell hit another long-range shot, but the Eagles closed the game 4-6 from the line to seal the win. “We knew that if they got going shooting it could pose a problem for us. We built up enough of a lead that we could withstand it late in the fourth quarter,” Ferguson said. There were times when it felt as though Sharon should have been up by a lot more, but in the end the Eagles held off Milton’s charge and gained experience in how to close out a playoff game. Sharon (12-9), the No. 15 seed, advances to face No. 2 seed Whitman-Hanson on Wednesday night. #15 Sharon, 56 vs. #18 Milton, 45 – Final – The Eagles were led by junior guard Ricardo Ripley, who scored 20 points and pulled in seven rebounds. Matt Lowerre added 16 points and 10 rebounds and Peter Banks also grabbed 10 boards and scored six points. Sharon will face No. 2 Whitman-Hanson on Wednesday at 6:30 p.m.
#16 Oliver Ames, 69 vs. #17 Plymouth North, 50 – Final – Carter Evin had a team-high 19 points along with four rebounds, Dylan Mahoney scored 17 points and had seven rebounds and Shawn Cardoza had eight points to go along with 14 rebounds. OA will play at #1 Bishop Feehan on Wednesday at 6:30. 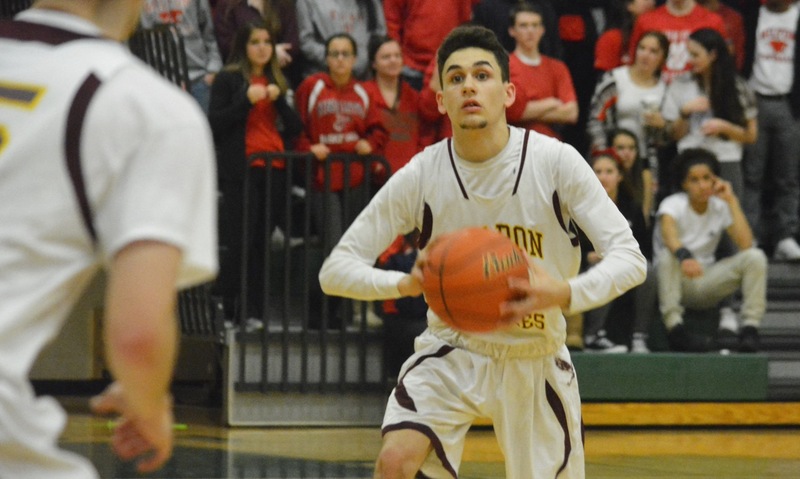 #9 Milford, 57 @ #8 Holliston, 62 – Final – Dimitry Torres led Milford with 22 points while Dwight Anderson had 12 points and Anthony Arcudi added nine points. Sophomore Kayden Kelley added eight points and 11 rebounds. SHARON, Mass. – Franklin’s defense certainly wasn’t bad in the first half, surrendering just 21 points to Sharon. But faced with a four point deficit at the break, Franklin head coach CJ Neely challenged his team to crank it up. The Panthers switched to a full court press to start the second half. The pressure worked off and turned it into a 10-3 run over the first three minutes of the quarter and then when Sharon got it within two again, the Panthers closed with another 10-3 in the last 2:30. Matt Lowerre drained a three to open the third to stretch Sharon’s lead to seven points but Franklin went to work from there. Kevin Gill hit a pair of free throws and after a turnover, freshman Jay Dieterle drained a three from the corner. Dieterle then put Franklin ahead, draining another deep ball and sophomore Connor Peterson followed it up with a two handed dunk after a nice screen from Dieterle and a perfect pass from Tim Prunier. Ricardo Ripley drove for two but two free throws from Dieterle and another bucket from Peterson extended the lead to five. David Roelke hit a high arching three to get within two, but the Panthers banged out another 10-3 run. Starting with a three from Dieterle – who had 11 of his 13 points in the quarter – Franklin was then able to get to the line. 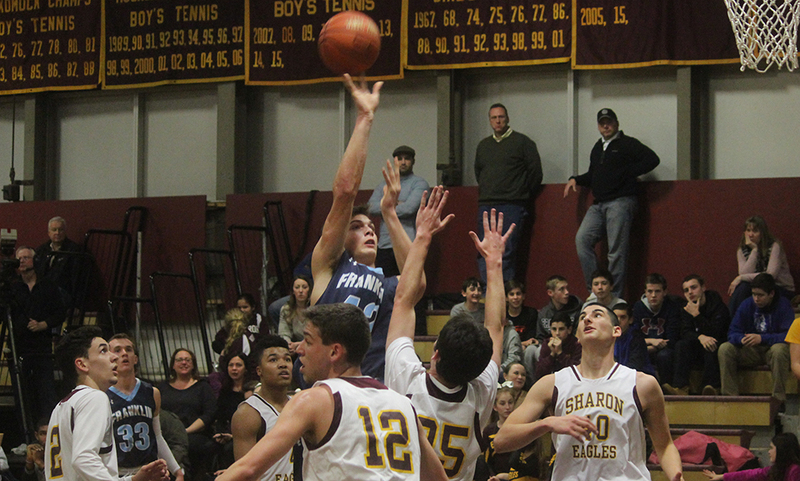 Prunier hit four straight free throws and the scoring for Franklin was capped by a corner three from Kevin Gill. Franklin turned a four point deficit at halftime into a nine point lead after three with a 24-11 quarter. And Franklin was fine. Sharon did cut the deficit down to seven with three minutes to play off a layup from Jimmy Fitzhenry but that would be as close as the Eagles would get. Prunier hit two more free throws and then Gill drove to the basket to ice it. “We couldn’t handle their pressure,” Sharon head coach Andrew Ferguson said of the difference between the first and second halves. “Franklin did an excellent job pressuring us in the back court. I think we threw the ball around a little too much. And for about a five minute spurt we left Dieterle open in the corner a few too many times. In the first half we did an excellent job contesting shots and contesting their drives. I think the second half we got a little tired, a little worn down from their press and we lost them a few times on the defensive end and that ended up being the difference. After hitting just one three on nine attempts in the first half, the Panthers connected from deep four times in the third in seven tries and finished 5/9 total from deep in the second half. Peterson was the game’s high scorer, netting 15 points but maybe the most impressive was his defense and his career-high 18 rebounds. Beyond Peterson, both Prunier (seven rebounds, four steals) and Dieterle (four rebounds) had 13 points while Gill added eight points. Lowerre led Sharon with 12 points and five rebounds while Peter Banks had four points and eight rebounds. Franklin (13-1, 11-1) earned its eighth straight win and will put that streak on the line on Friday when they host King Philip on Friday at 7:00. Sharon (9-5, 8-4) falls a game back in the Davenport hunt but will look to try and keep pace when they host Oliver Ames on Friday. Canton, 74 @ Avon, 33 – Final – Canton senior Griffin Jerrier recorded his first double-double of the season with a game-high 16 points and 11 rebounds. Tony Harris added 14 points, freshman Devin Foster had 11 points and Austin Maffie and Eric Olshaker each scored eight points for the Bulldogs. Sharon, 54 @ Wilmington, 47 – Final – Sharon’s Matt Lowerre dropped in a team-high 16 points and Andrew Filipkowski drained four three pointers and totaled 14 points to help the Eagles. Stoughton, 79 vs. Natick, 66 – Final – Brandon Teixeira scored a game-high 25 points and had nine rebounds as the Black Knights opened with a win at the Randolph Holiday Classic. Cam Gomes added 15 points and five rebounds, Ryan Sullivan had 12 points and four rebounds and Cam Andrews had 11 points and four rebounds. Drayton Tisdale had six points, nine rebounds and four assists. Taunton, 49 @ Durfee, 65 – Final – Jose Mercado scored 13 points and Tommy MacLean scored 12 points in the loss for the shorthanded Tigers. Mansfield, 43 vs. Cooperstown, 28 – Final – Caroline Maher was the top scorer for the Hornets, who ended Cooperstown’s 30-game win streak. Jackie Carchedi added 11 points for Mansfield and combined with Jen Kemp to hold Cooperstown’s top scorer, who came in averaging 26 per game, to just seven points. Oliver Ames, 56 vs. Walpole, 40 – Final – Kaitlyn McCarthy and Francesca Calabraro each scored 13 points for the Tigers. McCarthy added seven rebounds and four assists. Kayla Raymond scored 10 points, eight rebounds, four assists, and three blocks. Sam Bamford scored eight for OA, which advances to face Needham on Tuesday. Stoughton, 2 vs. Norton, 2 – Final – Sean Doherty and Eoin Doherty each scored a goal for the Black Knights. Marshfield Tournament (Mansfield, North Attleboro, Sharon, Oliver Ames) – North Attleboro had all members of the team earn points as they finished first overall out of 37 team with 223 points. Sharon finished seventh with 128.5 points, Oliver Ames placed 20th with 67 points and Mansfield was 34th with 26 points. North Attleboro’s Devin Spratt was named the Marshfield Holiday Tournament Outstanding Wrestler after winning at 120 with a pin over St. John Prep’s Malcolm Mitchell. Sharon’s David Ellis-Rech won at 138 with a 4-1 decision over Hingham’s Joey Ryan.